The twenty-third adventure of the well-dressed and debonair spy known the world over as James Bond has been stopped dead in its tracks. The movie — known simply as Bond 23 for now — had been moving forward with no apparent issues slowing its progress, even with studio MGM in some financial troubles. In fact, the movie was shaping up to be one of the best installments we’ve seen with Daniel Craig once again returning and Academy Award-winning American Beauty, Road to Perdition, and Revolutionary Road director Sam Mendes set to helm the film. Sadly, it appears that these financial woes have risen up to wreak havoc. In a statement made by Michael G Wilson and Barbara Broccoli of EON Productions, it has been announced that Bond 23 has been stopped in its tracks, put on hold, and will be kept there indefinitely until things are figured out. Due to the continuing uncertainty surrounding the future of MGM and the failure to close a sale of the studio, we have suspended development on ‘Bond 23’ indefinitely. 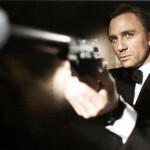 We do not know when development will resume and do not have a date for the release of ‘Bond 23. For all we know, things could get settled quickly and the movie could be right back in action soon. But with the movie looking at a 2011/2012 release timeframe, this could also see a devastating delay that sees the project lost in the shadows for who knows how long. One has to wonder how long is too long before Craig wouldn’t want to do another, and a new Bond would one again need to be chosen…not that that’s stopped them before. Another MGM movie that has been constantly talked about but doesn’t even technically have a greenlight yet is Peter Jackson and Guillermo del Toro’s The Hobbit. This is another that was apparently larger than these financial issues could affect, but with this news you, me, and everyone else will have to get comfortable with the painful reality that this could ultimately damage the highly-anticipated Lord of the Rings prequel films.